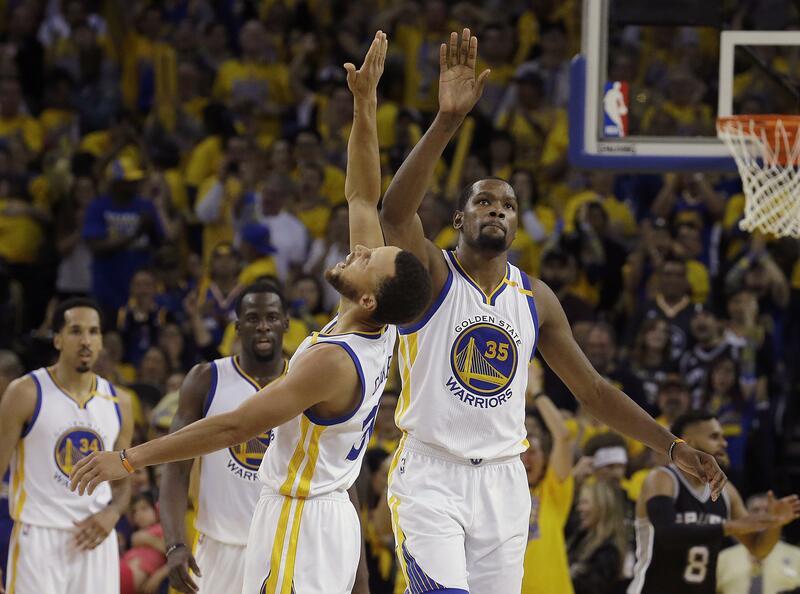 Sun., May 14, 2017, 4:01 p.m.
OAKLAND, Calif. – Stephen Curry scored 40 points and hit a tying 3-pointer with 1:48 remaining, and the Golden State Warriors rallied from way down after Kawhi Leonard was lost to an ankle injury to beat the San Antonio Spurs 113-111 on Sunday in Game 1 of the Western Conference finals. Draymond Green gave Golden State the lead for good on a three-point play after the Warriors trailed by as many as 25 points. Leonard left in the third quarter after he re-injured his left ankle, and the Warriors capitalized with an 18-0 run. Kevin Durant scored 10 straight points during a key fourth-quarter stretch on the way to 34 points, while Zaza Pachulia had 11 points and nine rebounds. Leonard had 26 points and eight rebounds. LaMarcus Aldridge delivered another clutch playoff performance with 28 points and eight boards. Somehow, these unusually careless, cold-shooting Warriors found a way to keep their unblemished postseason record alive at 9-0. Game 2 in the series is Tuesday night back at Oracle Arena. Curry scored 19 points in the third quarter and went 7 for 16 on 3s and 14 of 26 overall. Leonard first went down after stepping on a teammate’s foot along the bench after taking a shot. Pachulia later slid into him as he came down from shooting and Leonard fell into the Spurs bench, grabbing his ankle. Losing Leonard could be a story of this series. He shot 7 of 13 in 23 minutes to go with eight rebounds and three assists. He made all 11 of his free throws. He sat out Game 6 of the last round against Houston, a 39-point, series-clinching win on Thursday, after injuring the ankle in a Game 5 overtime victory. Durant has repeatedly spoken of elevating his game when it matters most – and wow did he do it at the very moment the Warriors needed a huge lift on their home floor. His 3-pointer with 7:53 to play got Golden State within 94-88, then he drove to his left and right by Kyle Anderson for an emphatic one-handed slam the next possession to ignite a deafening sellout crowd. Durant hit another 3 at the 6:10 mark and a jumper the next time down before Shaun Livingston’s driving dunk. Gregg Popovich lost to good friend and old pupil Mike Brown, filling in as Warriors acting coach for the ailing Steve Kerr – who played for Popovich. Yet for much of the afternoon, the Spurs outplayed the mighty Warriors on both ends of the floor. They crashed the offensive glass as they so like to do – something Golden State stressed all week – going right at defenders in the paint and forcing the Warriors into tough shots. Even the open looks weren’t falling. The Warriors missed their initial five 3-point tries before Curry hit 5:05 before halftime to ignite a stunned-into-silence sellout crowd as Golden State got within 46-32. The next sequence the Spurs managed three offensive rebounds before scoring. San Antonio had six steals among the Warriors’ initial nine turnovers and Golden State wasn’t getting the kind of easy shots it was used to going almost untested the first two rounds. Even when the Warriors did things right the Spurs answered. Kerr watched the game from behind the scenes in the arena a day after returning to the practice floor for the first time in more than three weeks. Published: May 14, 2017, 4:01 p.m.